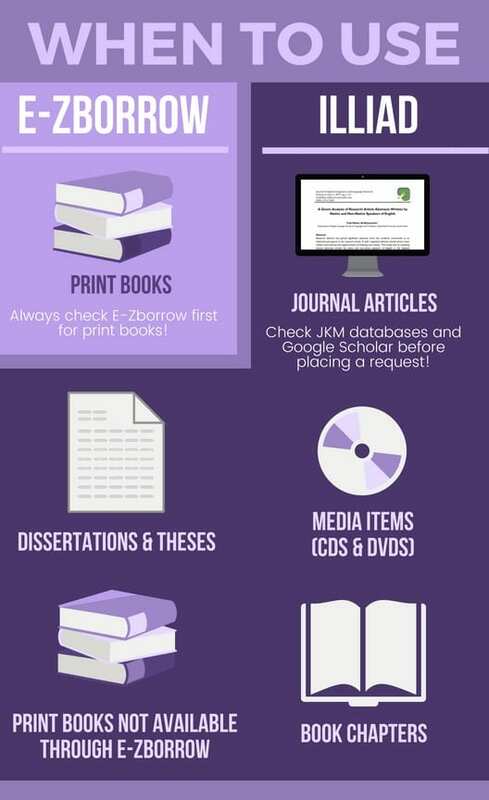 Here at the JKM Library, our librarians do their best to ensure that the collections and resources we provide fit your needs as students, faculty, and researchers. Our library’s stacks are home to over 144,000 physical books, magazines, print journals, DVDs/Blu-rays, CDs, and more. And through the library’s website, you also have access to electronic resources such as e-books, journals, magazines, and newspapers. Amazing, right?! While this is a huge number of resources at your disposal, it’s likely that at one point or another throughout your Chatham career you will want to get ahold of something that is particularly unusual, hard-to-find, or simply beyond the scope of our collections as an academic library. Whether it’s because your thesis is on a fairly niche topic and you need to find sources for it, you’re looking for your textbooks for the new semester, or you were just hoping to read the latest YA release that hasn’t made its way to our Curriculum Collection shelves yet – whatever the reason, interlibrary loan can help you access the books, media, and articles that we just don’t have in our collections. It would be impractical, not to say virtually impossible, for a library to retain a copy of every single book ever published, so many libraries purchase books they anticipate that their patrons will use and then rely on interlibrary loan (ILL) to help bridge the gaps in their collections. ILL is a resource sharing service used by libraries all over the world that allows their users to borrow books, DVDs, music, articles, theses, and more from other libraries that they have formed cooperative agreements with. The best part is, at Chatham, this service is available to you completely free of charge! The library covers all normal shipping costs for interlibrary loan items. We currently use two different systems to manage your interlibrary loan requests here: E-ZBorrow and ILLiad. Both are useful for finding different types of materials, though there are a few key differences between them and what you would want to use each system for, which we will explain here. E-ZBorrow is an expedited regional ILL service that combines the catalogs of over 50 libraries throughout Pennsylvania, New Jersey, New York, and West Virginia! That means that since all of the participating libraries are located within a relatively small region, this is the fastest way to get a book that we don’t have at the JKM Library – E-ZBorrow books typically arrive within 2-5 business days. E-ZBorrow also allows you to keep the books for a pretty long loan period: for students and adjunct faculty, E-ZBorrow books are due at the end of the semester, and for faculty and staff, it’s 16 weeks from the date of pick up! However, while E-ZBorrow items arrive more quickly and allow you longer loans, one downside is that it is only for print books and sometimes DVDs. Other resources must be requested through ILLiad, which brings us to the second system. ILLiad is a resource sharing software which connects us with libraries all over the United States. We have mutual lending relationships with hundreds of libraries, so when you place a request, that item may be shipped from a public library in Oregon, an academic library in Texas, or anywhere in between. It’s a powerful tool that grants us access to a far-reaching pool of potential lenders, and also allows you to request materials in a large number of different formats – including PDFs of journal articles, DVDs/CDs, dissertations, government documents, reports, microfilm, and print books that you were unable to find using E-ZBorrow (but please do remember to check E-ZBorrow first!). The electronic delivery of journal articles, reports, and other documents is one of the major advantages that ILLiad provides, as electronic delivery helps to drastically cut down on shipping time and costs and also allows you to access the article from anywhere, without having to stop in the library. Be mindful, though, electronically delivered articles will disappear from your account after 30 days due to copyright guidelines – so be sure to download those articles to your computer! For physical loans, however, shipping times can sometimes take a few days to over a week or more depending on where the library is located, and how long you can keep the materials often varies based on the lending library’s policies. You can keep track of the status of your requests online through your ILLiad account page to monitor whether they have been shipped yet. So as you can see, there are certainly positives and negatives to using both systems, and which one you should use largely depends on the type of materials you are trying to request. But both of them can be incredibly helpful resources to you in your academic work and your leisure time. 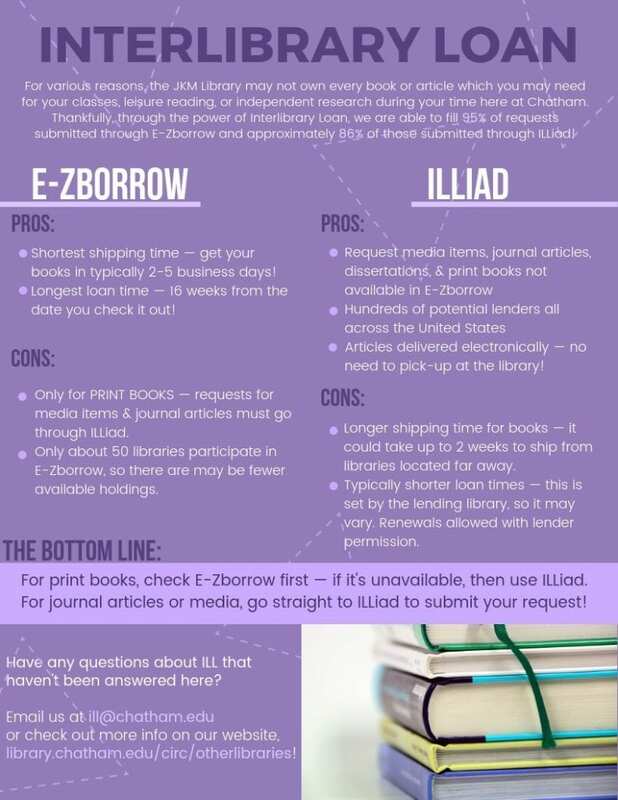 We’ve compiled a couple of infographics to summarize the main points made here and to help you determine when you should use E-ZBorrow and ILLiad. Check Google Scholar before submitting an ILL request. Open access publishing and authors sharing their research digitally is becoming more and more common these days, and so we have been finding many articles available completely free online! Don’t wait until the day before a paper is due to find the books and articles you will need to write it. It can take anywhere from 24 hours to over a week for electronic articles to arrive through interlibrary loan, and books can take up to 2 weeks, depending on where it’s shipped from. Our loans come from all over the US, so give us time to get things for you! Make use of the public libraries, as well – as a resident of Pittsburgh, you can get a library card that will allow you access to the millions of print and e-materials available in the Carnegie Library’s catalog. If you don’t mind visiting one of the neighborhood locations, you can save some time so that you don’t have to wait for the book to ship – and also get an opportunity to explore Pittsburgh! Our ILL staff tries their best to find each item that is requested by our users request. However, for a variety of reasons, some items can be very difficult to obtain, including bestsellers, new books, rare books, foreign journals, dissertations, audiovisual formats, etc. That said, in 2017 we were able to fulfill 95% of E-ZBorrow requests and about 86% of ILLiad requests, so we are able to fill the vast majority of requests. It’s always worth a shot! If you have any lingering questions about interlibrary loan or either of these two systems, please feel free to check out our Frequently Asked Questions or email the Interlibrary Loan Staff at ill@chatham.edu! We are always happy to answer any of your questions and chat about the joys of resource sharing. Mikayla Wobrak is your friendly campus interlibrary loan specialist and one half of this year’s Edible Books “Most Sustainable” award-winning duo. When she’s not working toward her MLIS degree or fulfilling your ILL requests, you can find her listening to paranormal podcasts, working on some ambitious new DIY project, or geeking out about her love of public transit. She is also a Teaching Artist with the Pittsburgh Center for Creative Reuse.